This chocolate is so heavenly. It’s not too sweet, and you can taste the spice and the zing. I just received a box in the mail and am savoring every piece of it. I know I’m supposed to concentrate on the chocolate, but I also love the packaging it came in. The whole product is a delight for my senses. 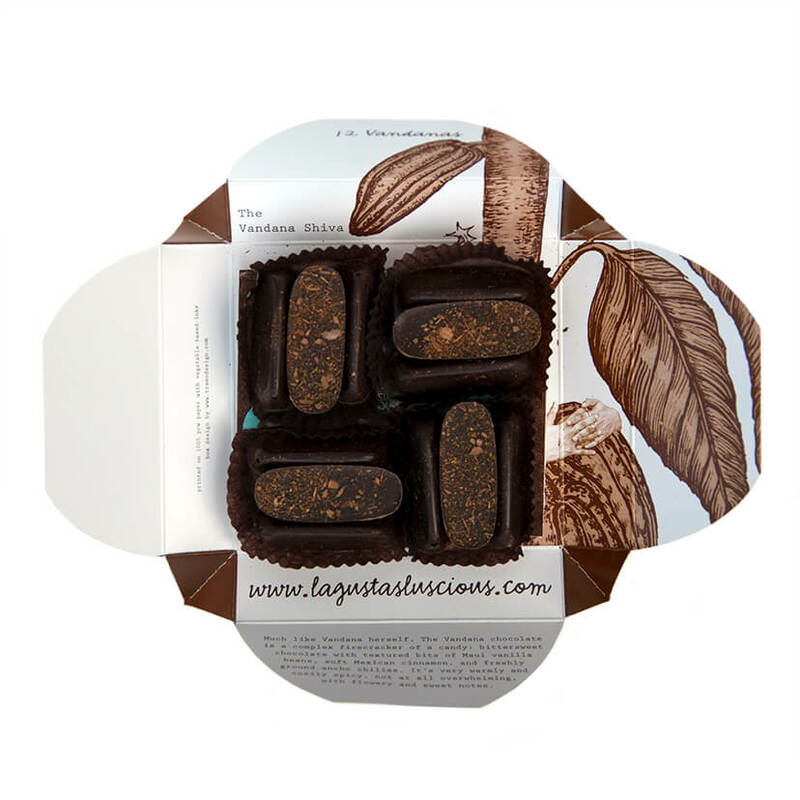 Organic and fair-trade dark chocolate (cocoa paste, cocoa butter, vegan sugar, soy lecithin, vanilla), spices, beyond-organic Maui vanilla beans. 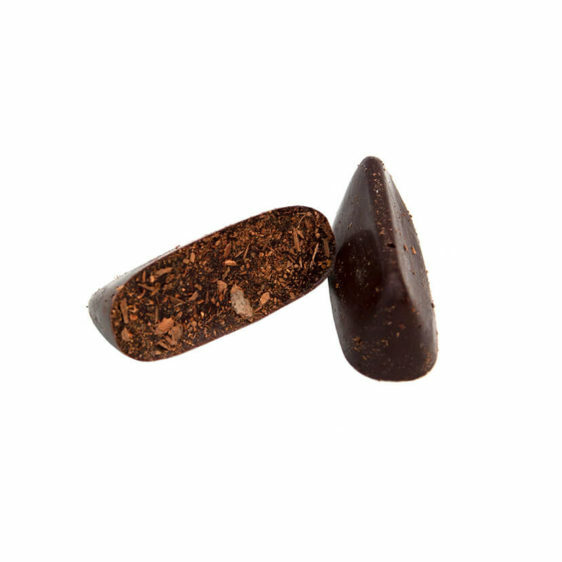 Deep flavor from mild ancho chilies, Maui vanilla beans, and Mexican cinnamon, plus magnificent texture from stoneground chocolate. Named for Vandana Shiva. 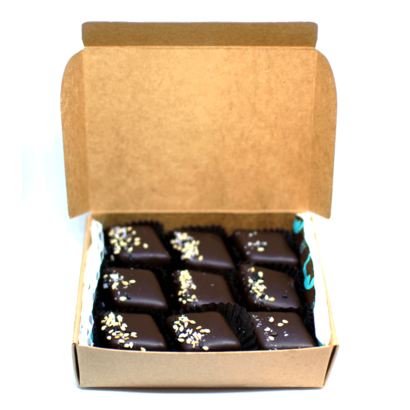 Much like Vandana Shiva herself, The Vandana chocolate is a complex firecracker of a candy: bittersweet chocolate with textured bits of Maui vanilla beans, Mexican cinnamon, and freshly ground ancho chilies. It’s very warmly and cozily spicy, not at all overwhelming, with flowery and sweet notes. This bonbon is made with Taza chocolate, a stoneground, organic better-than-fair-trade (they use a direct-trade system that is superior to traditional fair-trade certification), bean-to-bar, biodynamic, recycled paper-packaged, bike-delivered chocolate (from Chiapas!). Phew! That’s some liberal cred! 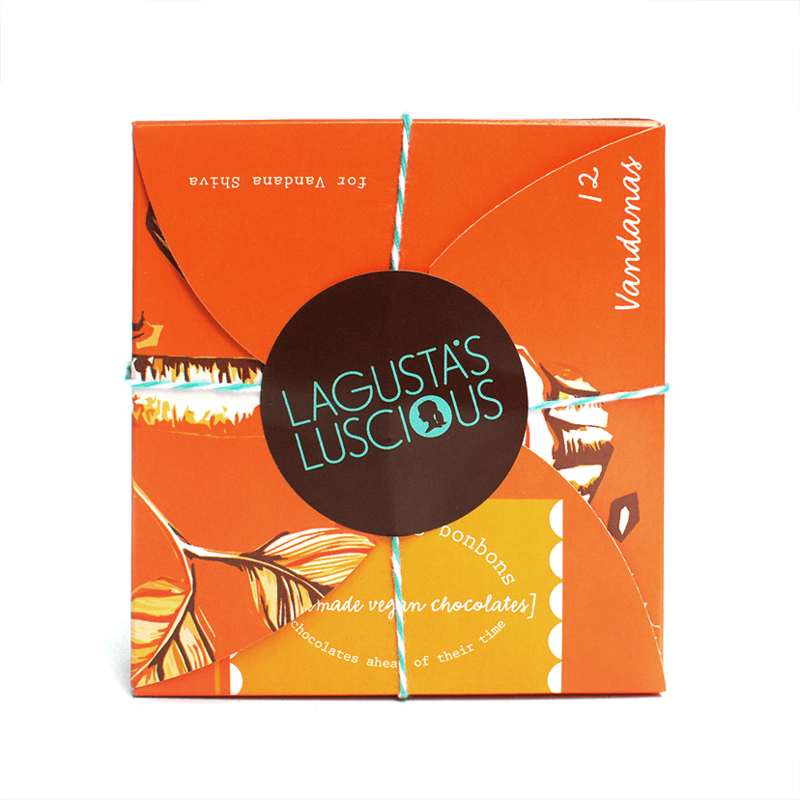 European-style chocolate is the result of many steps—chocolate is not a heavily refined food in the sense that it is chemically treated or “modified,” but it takes a whole lot of mechanical potchking around to get it from bean to bar. 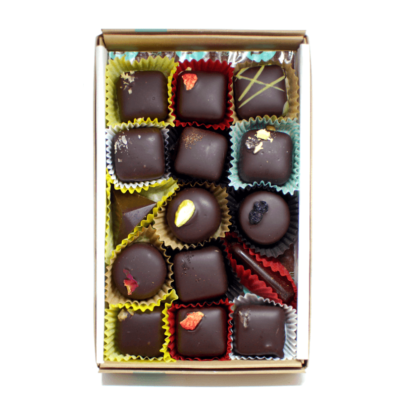 1 box, 12 pieces, 5 oz.